Opening at Sydney Theatre on 13 March, 2012, 2 One Another is a thought-provoking investigation into human interaction. With 2 One Another, master collaborator Rafael has joined forces with the visionary Production and Creative Designer Tony Assness (36O°, Brisbane Festival, Sydney Harbour Bridge 75th Anniversary), the highly-in-demand Lighting Designer Benjamin Cisterne (Mix Tape, Aviary, Halcyon) and contemporary Sydney Composer Nick Wales (Happy as Larry, CODA, Mental as Anything).The work was shaped during a creative development with the Sydney Dance Company dancers and poet Samuel Webster in September 2011. 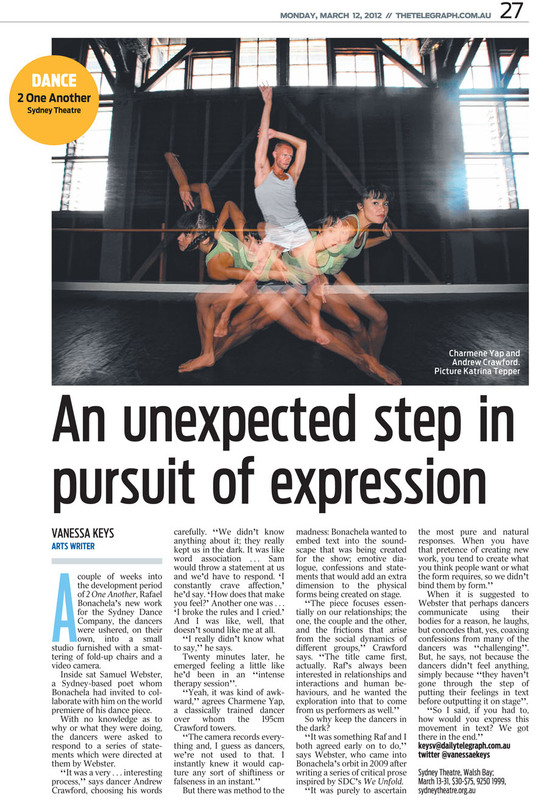 Together, using movement and text, they explored the philosophies of human relationships – the individual, the couple and the group – and the impact of external dynamics on these connections. The result is an examination of physical reaction and emotional impulse – the coming together of a choreographer’s vision, a poet’s expression and the minds and bodies of a group of highly talented dancers.